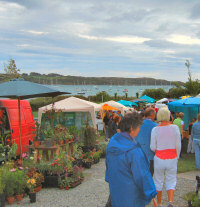 West Cork (Ireland) is home to a unique collection of weekly Farmers' Markets - held in town and villages from Schull in the far South-West to Bandon in the East. Every week (come rain or shine) the local artisan food producers, crafts people and artists, and stallholders bring their wares and set up their stalls to provide a great social and shopping experience for locals and tourists alike. 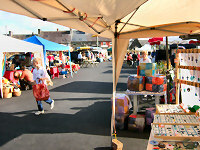 WestCorkMarkets.com is a celebration of these hardy folk and their markets - whether you’re here on holiday or if you live locally - why not drop in to your local market this week - you’ll be pleasantly surprised at what’s on offer. 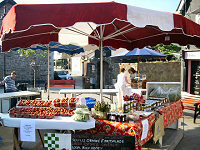 Welcome to westcorkmarkets.com - your personal guide to the Farmers' Markets of West Cork, Ireland. 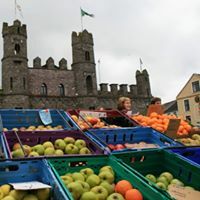 West Cork has a strong tradition of slow food, eclectic crafts and great craic - nowhere is this more prevalent than at the many local Farmers' Markets. You might be a local, looking for an alternative venue for your weekly food-shop, or you might be a visitor (welcome!) looking to get a flavour of the unique 'West Cork culture' - either way, you'll find this little website to be a helpful guide to what's on and when. Fresh/organic/local fruit, veg, meat, fish and cheese, fresh baking and ready-to-eat foods, unusual local art & crafts, a wide selection of bric-a-brac and collectibles and a great day out & a friendly Irish welcome. 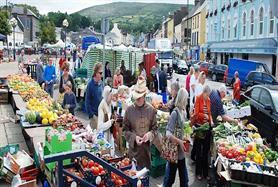 Here’s all the details of your local West Cork Markets. If we’ve got anything wrong - or we’ve missed out your favourite market - please contact us and we’ll put it right! To find out more about any of these markets - please contact the market organisers directly - their details are listed below. Olives, cheese 3 veg/fruit stalls (1 conventional, 1 organic 1 chemical free), 3 plant stalls, 1 flower stall (seasonal), a honey stall, a coffee stand and 2 cake stalls. Then there is a stall selling footwear, another with clothes and a carpet stall. Organic veg, coffee, chocolate, olives, Irish cheeses, pizza, BBQ, confectionery, crepes, sprouts, fish, pulses, Indian spices, vegetarian, breads, plants, pestos, salsas, soft fruit in season. 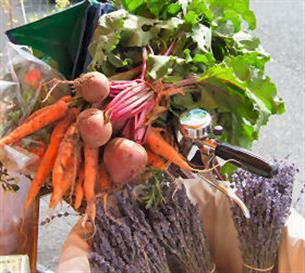 Local produce includes fresh fish, organic meats, honey, eggs, garlic, vegetables, bread and baked goods. Plants ( tomato, courgette etc.) available in season. This market has seen peaks and troughs over the past few years. Located on the square where the famous ‘McCarthys Bar’ of book-of-same-name fame is located, this market has a wide range of items available for the curious and hungry. 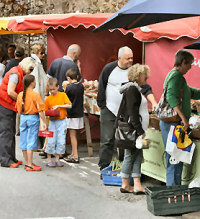 Hosted on the traditional market day you could come out of this quirky market with a dizzying array of items. A box of ducklings, antique jewelry, historical books, fishing rods, olives, fresh buffalo burgers, exotic plants, a carpet and a pair of wellies could easily represent a day’s shopping at this beautiful little market. The hard-nosed haggling that goes on here is a joy to behold, with intricate wheelings and dealings that would put the Dail to shame. 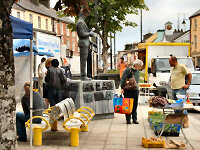 - with a great selection of local food and crafts, right in the centre of Clonakilty. One of the larger West Cork markets, Bantry Market occupies the central town square and spills out into the adjoining roads and car parks. The regular Friday market gets even bigger on the first Friday of each month (the traditional Fair Day) when it's not unusual to see donkeys tethered to lampposts and cages full of ducks and hens for sale. Contact - Market Manager - 086 7944419 If you’d like to set up a stall and sell at the Market - you need to provide your own table and shelter, and book your space by texting “Bantry”, your name, length of stall, type of product, and if vehicle required at stall, on Thursday afternoon before 6pm in advance of the Friday market. If you don't supply all of this information then we cannot guarantee to find a space for you. Organic fruit & veg., food, baking, cheese, fish, meats, olives, eggs, honey, preserves, plants, local art & crafts, pet & poultry supplies, fresh stonebaked pizza, bric-a-brac & collectibles. A very busy local market - offering great value and a chance to catch up on the local gossip - with an amazingly wide selection of stalls - just off the main street in Skibbereen. web ~ email - see website. Bandon Farmers' Market was set up in 2006 by a voluntary committee, who shared a love of good food, to supply a wealth of local and artisan produce to the residents of Bandon and the surrounding area. Early every Saturday morning the car park of the Old Market Garden buzzes with the activity of stalls setting up and the first customers arriving. One of the newer West Cork Markets - features local suppliers including home baking, fish, organic meat, coffee, fruit & vegetables, cheese, Asian food, jams & chutneys, local crafts and more. The beautiful seaside village of Schull provides a stunning backdrop to this great market - where everything on sale has been made or sourced locally. Pick up the makings of a picnic - then sit and enjoy it while watching the sea! Market Shop open 7 days a week from 11am to 5pm in the Market Shop, The Old Creamery, Kilcrohane. The Sheep's Head Producers' Market is an outlet for food, crafts or any other product which is grown, produced or made within the Sheep’s Head community. - and is now maintained by the folks at MAST (Markets Alive Support Team Ltd.) who offer exclusive insurance products for market traders, and a wealth of valuable information about how to trade in Ireland's vibrant market scene. Visit their website for more information. 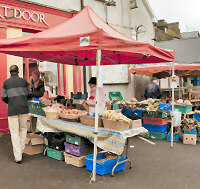 Enjoy your visit to the Farmers' Markets of West Cork! in and around the Temperance Hall on Short Quay, Kinsale.